Kate Austin Spina: Would you ever consider a spin off, following April? Lynn: When a California producer asked about FBorFW as a sit-com, the suggestion was made that April be the focus. She’s at an interesting age, has a garage band, is thinking about becoming a veterinarian…but again, she would have to move from Canada to the US! In order for a story about the Patterson family to work, a Canadian company would have to be involved. The story is Canadian. April could visit the States, even work there for awhile, but she and her family are Canadian and I want them to stay that way. Realistically, I doubt that there will ever be a continuation of the story – as a live action series or as a comic strip. Some things need to be left as they are. I’m happy to have you design a future for April…let me know what you come up with! Andrew KIeswetter: Did you ever plan to have Michael marry Martha or Rhetta instead of Deanna? Lynn: No. I think Michael and Deanna are well suited. I’m hoping their marriage lasts. Sally Barry: Did Liz hang on, martyr-like, to the ghastly ugly Anthony? I loathed him and was so disappointed she left the great white north and the cute native policeman to go back to white bread land and Anthony’s stache. Lynn: Yes, Elizabeth married Anthony and I think their marriage will last. Romantic as some relationships appear to be, they are sometimes just part of one’s personal story. Karen Hiebert: Are there any storylines/characters you regret doing? Lynn: No. I don’t regret any of the story-lines or the characters I made up. They all fit in. They were all fun to work with. Are there any you wish I hadn’t written about? Heather McDaniels: Elly’s father was a WWII veteran. If he were with us today, what would his thoughts be of the rise of white supremacy in America, something we, ourselves, are struggling to understand? Would he speak to the children about his time during the war, and might Michael write about it? This is something I wish someone would do, as it’s hard to explain to kids other than “they’re very bad people” & “they’re racists,” and trying to explain that. Thank you. 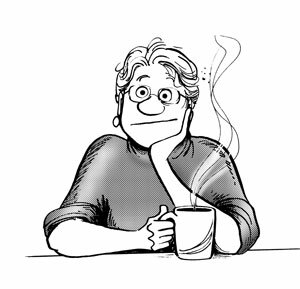 Lynn: Elly’s father, one of the grandfathers in the strip, was based entirely on my dad, who was a veteran and one of the kindest men I ever knew. His philosophy was “greet everyone as an equal and give everyone a chance”. His circle of friends was wonderfully diverse. He wanted to experience as much of life as possible through the people he met in his shop. The coffee was always on, and the conversations were always interesting. Because my dad was so unconcerned about peoples’ colour, shape, education, or income, he travelled the world through his friends and he had a million stories to show for it. Dad was a storyteller. You can’t tell stories if you don’t learn about people, and you can’t learn about people if you are afraid to talk to them. It’s fear that keeps us apart. I learned through my dad and through the strip that we are all exactly the same. All of us. That was “the grandfather’s” philosophy–and it’s also mine. Paul Jones: What’s Phil’s wife Georgia’s maiden name? We never found that out. Lynn: I honestly don’t remember. If it was never mentioned in the strip, then I have no idea! Make one up. That’s what I’d do! 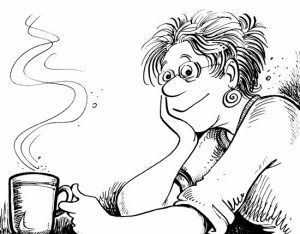 Linda Davies: Was there ever a storyline or subject matter that you WANTED to include in your strip but never did? Lynn: I wanted to do a story about Annie’s husband and his infidelity. I never did. Other stories came into my head instead, and this one sat on the periphery, just simmering away. Perhaps, it was too just too close to home. Letitia Schuman: How are the kids and grandkids, in real life? BTW I still have the letter you sent me over 20 years ago with your signature which contained your doodle in the middle. Always loved your strips. Lynn: It’s wonderful that you want to know what’s happening to the FBorFW characters now. The truth is…I don’t know. When the story ended, I stopped connecting with them. I thought I’d be fighting new ideas, wanting to continue, but no ideas came. The story ended…just like that. I wish I could tell you what happened next and how everyone is doing. I have no idea. I want to know if Dorothy in the Wizard of Oz ever got married and had kids and told them about Oz. There are 13 Oz books and I read them all. They ended with Dorothy still a child. Some stories you just have to finish yourself….and perhaps that’s a good thing! Heather McDaniels: I was wondering if there would be reprints or a collection book of the trio “David, We’re Pregnant,” “Hi, Mom! Hi, Dad!” & “Do They Ever Grow Up?” which chronicled the years between finding out one was expecting & your child turning two/three. I purchased them when I was expecting my first child & got them for a couple of friends who were expecting, but can’t seem to find them anywhere anymore. This entry was posted in We Asked Lynn and tagged facebook interview on November 22, 2017 by fborfwnews. Jason Young: Having your strip brought to the small screen was a massive undertaking on your part, what were some of your fears and hopes for that undertaking? All the best. Lynn: I was honoured to have had the opportunity to see my work animated. This is an overwhelmingly costly and time consuming art form and the number of people involved is amazing. The first show, “The Bestest Present”, was one-off and written by me. I was able to work closely with the artists: storyboard, layout, background, key, and in-between. I chose the voices and directed the recording and I worked with the camera crew and musicians as well. It was a huge amount of work, but an exciting and fulfilling experience and the result was one really nice show. Even with all the attention to detail, however, mistakes were made (no wheels on a moving toy train, for example!) but the show won a Gemini Award for children’s programming, and all of us were proud of what we had accomplished. I’d hoped to continue to do one show at a time, but this studio went out of business and I was approached by another. Specials were/are not as easy to sell as a series. I agreed to a series of six, and when you do a number of shows at once, problems arise. I needed writers because I couldn’t oversee a series of scripts and produce the strip at the same time. I worked with superb writers, but even so, the speed with which the shows had to be done meant farming out sections of each show to other studios, some as far away as India. Work would be returned with some big errors – no fault of the animators. I would find this out after the show had gone too far into the system to make necessary changes, and these errors went into the finished shows. Budget problems were often announced in the middle of a process, so we might have to omit some music or sound effects–and sometimes big areas which should have been animated were done badly, or left out altogether. Budget was a constant problem. Speed, too, was a huge problem, and the result was a series of average shows which never really went anywhere. If we had been able to do one at a time, we would have been able to do some artfully animated, worthwhile shows. I have refused to allow my work to be done in a fast and careless way again, so no shows have been done in a long time. Still, I have been captivated by, in love with animation for as long as I can remember. Like every other artist who works in the industry, I’m willing to work my heart out for a good show! Who knows. Maybe I’ll be able to collaborate with a good studio again some day! Never say never. Patrick Verdant: What made FBorFW exceptional is the fact that characters are aging, evolving into time. It surely help you providing new ideas and new challenges for the characters. Was there a moment you regret it and would have prefer to keep them still in time ? Lynn: Once the characters began to age in real time, I was happy to have the challenge. I never wanted to halt the aging process, but there was a time when I really missed having a baby in the strip, so April was “born”. She provided me with the chaos, the added responsibility, the baby talk, and the action I needed. Changing the characters was interesting. I had height charts. I had books on child development. I had my own kids, but cartoons are a species unto themselves, so aging a cartoon is tricky. You can’t change a character too much or you lose the “essence” of the character. In real life, people change in dramatic ways. Sometimes we don’t recognize a good friend, just because she’s had her hair cut and coloured, now wears glasses, or has lost or gained weight. A cartoon character must always have a very recognizable look, so the changes I made were subtle, like height or a slight alteration in hairstyle. Even the behaviour and speech patterns of the comic strip characters had to be gradual and hardly noticeable. The adults were easier to age. I added glasses and eye bags, and extended the neckline. I was often asked to change Elly’s hair, but to cut her hair would have been to remove the essence of the character, so she always had a rather dowdy hairstyle! No, I never wished I’d kept the characters the same age, even though it would have made licensing them easier. Having them age made the strip more interesting for me to write and draw…and I grew up with them! Erica Forrest: How would you deal with some of the people who were negative about the storyline or content? Lynn: Anyone who wrote to me with good criticism was appreciated. We work for an audience, and sometimes my “negative” readers caught some serious errors and made some great observations. I responded to every letter worth responding to. It was the abusive and rude stuff that I ignored. These people never got a response. What’s the point? I once met one of my “trolls” at a book signing. I couldn’t believe that after all the garbage she had thrown at me, she was there to have a book signed! I asked her why she worked so hard to hurt my feelings if she liked the strip. She said she and her co-trolls were doing me a favour. Really? Go figure! Lee Williams: Lynn, was I your favourite Animation Co-Director you’ve ever worked with? Let’s pitch a live action sitcom of FBorFW. Who plays you? Lynn: Lee…I miss you! We should talk! …A live action show has been pitched a number of times, but when you think about it, the FBorFW story is about an average Canadian family. Not too exciting by today’s standards. The last group to make an offer was a US production company and they wanted the “Patterson family” to live in the states! Not possible. I can see working on a show that covers the story from the time the strip ended. You never know. Some day, that might happen….but it would have to be a Canadian company wanting to do a Canadian show in Canada! Birgit K. O’Connor: I love your strips. I wonder have you meet any deaf people in your life…. Lynn: I have met very few deaf people in my life. When we were kids there was a “School for the Deaf” in Vancouver. We would watch their soccer games from the sidelines and the students who attended the school would talk to each other in sign language. It was fascinating. The signing kids were able to speak in a different language and we hearing kids were left out! It was one time when kids with a “disability” ruled! Much later, when I was doing speaking engagements, people would be there on stage with me to sign for the deaf. They were amazing. During my talk, I would list off a series of things in the “Museum of Dirt” (yes, it exists) and talk so fast they couldn’t keep up. This would always end in a lot of laughs, some serious hugs and an opportunity for me to introduce my signing companion to the audience. I have always been fascinated and impressed by this dramatic and emotional way of speaking. People who sign wear their hearts on their sleeves. They act, they express themselves profoundly and they story tell. What a wonderful skill to have. Michelle Wood: I loved how you wrapped up your strip….I was sad to see it end but I did understand. I am curious…..in your creative mind did you know how the rest of the characters’ lives played out??? Lynn: When I ended the story, I had a good idea of where the characters’ lives would lead them. I wrote some text on the last strips, to say what eventually happened to everyone. Still, life never follows a script, so what happens next is anybody’s guess! It was this very question which allowed me to write and draw the strip for almost 30 years. I confess, I don’t think about the characters at all now. It’s as if I’ve let them go. I’ve allowed them to live without the strings I attached to them. They’re free! Yup. And so am I.
Sam Pazen: Thank you Lynn. April was born around the same time my son Josh was and it was nice watching them grow up. i also rooted for Liz and Anthony. How is Francoise doing with Liz as her stepmom and is her mom involved at all? i guess i ask because you made the characters so real. Lynn: Thanks for your question, Sam. I often meet people who say they were born when April was and I feel a special kinship to them all! Again, I confess. I haven’t stayed in touch with any of the FBorFW characters. Please continue the story in a way that makes you happy. It’s quite an experience, being “in charge” of someone else’s life! Ann Stearns Rawson: Most of your characters were similar to your family members. Did any of your family object at any point? 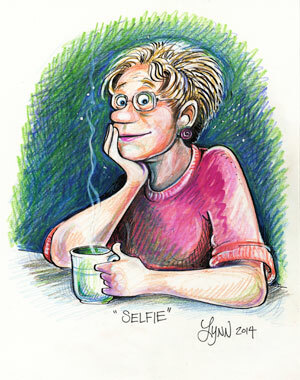 Lynn: There were times when my husband objected to the way I portrayed him. I said some harsh things. Still, when I re-read all my work, I can now see that I told some raw truths. I let people into my real world–because that’s all I knew. John Patterson was a great character to work with. So was Elly. I took the worst and the best of both of us and I put those features into the strip. For many reasons, it was really “For Better or for Worse”. My kids and I are great friends. They didn’t pay much attention to the strip when they were little, but they are reading it now, and it’s fun to hear them say they are learning more about our family, and their childhoods. It’s been an interesting journey, and it affected us all in different ways. Peter Partridge: Did a North Vancouver childhood inspire your creativity in your comics? We wonder if the West Coast weather whet your wilder inspirations. Lynn: Yes! The west coast played a huge role in the strip. I relived my childhood in North Vancouver every time I worked with the comic strip kids, and many of the auxiliary characters were based on teachers, family, and friends on the North Shore. Memory played a huge role in my writing, so the west coast of Canada was as much a part of the strip as Ontario was. Kathleen Duggan: If you were still drawing the strip, what would become of Lawrence and his partner? And also the same with Gordon and Tracey? Lynn: My guess is that Lawrence and his partner have a thriving landscaping business, and their biggest concern is that their company might become too large to control. The same might be said for Gordon and Tracey. They had an excellent business as well. Success isn’t always easy to manage, so I hope they are all doing well and staying together. Danielle Brown: Hello Lynn. How did you keep your enthusiasm, your motivation, and the belief in yourself for the many years of FBorFW ? I love the characters and the story lines. I just wonder how you handled niggling doubts. Lynn: I kept my enthusiasm for FBorFW because everyone in the strip was real to me, and I wanted to know what was happening in their lives. I felt I was telling their story. The only time the work became difficult was after my divorce. For a couple of years, I had to write and draw the strip as if nothing had happened. This was one of the hardest things I’ve ever had to do! I’m lucky to have such a good mind for fantasy. This entry was posted in News, We Asked Lynn and tagged facebook interview on November 10, 2017 by fborfwnews. Matt Dodge: Was there a particular character or location you found more difficult to draw than others? Lynn: Anything that was an establishing shot: what a school looked like, how a road curved, what friends’ houses looked like, workplaces…anything on which I would have to base a series of illustrations was tricky to do. Zane Andres: How can you have boldly stood your ground against ignorance with stuff like your storyline about Lawrence coming out only for your staff to now censor your work because of the false notion that “people might be offended”? Lynn: You defend the things you believe in. You do it with confidence and courtesy. In the end most editors were comfortable with the story line, but they had to deal with readers who were not. I was proud of that story. Nicole Greening: Do you miss the Pattersons? Lynn: No, I don’t miss the Pattersons. I told their story to the best of my ability and then I had to let them go. Pamela Scott VerLander: How is Lynn doing? Lynn: I’ve never been happier. Thanks for asking. 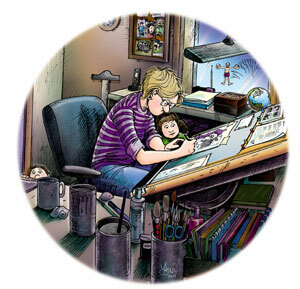 Terri Kimble Fullerton: How did you encourage your own kids to explore their creative sides? Any recommended art supplies, activities or resources? Lynn: When I saw what interested my kids I did encourage them, as all parents do. The best resource for them, as it was for me, was school. Their teachers did for them more than I could ever do, and they did the rest on their own. Art supply stores like “Michaels” give you incentive, just by walking into them! If you have the gift, you find what you need and you play with it. Guidance comes from outside, but creativity comes from you. Jim Inman Jr: You’ve been very honest in your writing and creations about the ups and downs of life. Has FBoFW ever been used in some type of psychology experiment or study? Lynn: Sure. FBorFW has been used to teach ESL [English as a Second Language] – comic art is a great help to new Canadians. It’s a glimpse into North American society and our every day use of the language. The Lawrence story was the catalyst for discussion in schools and churches as were other story lines. For a cartoonist, this is always a real compliment. Jim Inman Jr: What was the best compliment you ever received from a strip reader? What about from one of your peers? Lynn: The best compliments are when people tell you that you’re saying what others feel, and that you lightened someone’s day. My peers never had to say anything. We all knew what we were capable of; we knew we had a gift. Like musicians, we worked as a whole, each understanding the other, connected through a kinship that’s rare. Their genuine friendship was and is compliment enough! P Shane McAfee: I wrote about you on my blog several years ago and you sent a very kind email in response. First of all, thank you for taking the time to do so. Secondly, I referred to you as a Canadian Erma Bombeck. Having said that, who influences your work (aside from your family)? Lynn: Thank you. I met Erma Bombeck once. We sat side by side at a cocktail party. There was a large book on the coffee table in front of us and a photo of mother Theresa was on the cover. Erma looked at the photo and said: “She needs moisturizer”. I’m still laughing. Many people have influenced my work in that they have kept me confident, knowing I was not alone in my need to be the “class clown”. Erma Bombeck was one, Phyllis Diller was another and so was Robin Williams. I had the great pleasure of meeting all three. From cartoonists to writers to comedians, I have met most of my comedy heroes. How lucky is that! All of them have influenced me in one way or another. This entry was posted in News, We Asked Lynn and tagged facebook interview on October 1, 2017 by fborfwnews. Andy Sable: Does she still miss Farley? Lynn: I don’t miss Farley…I can bring him back to life with the stroke of a pen! Éric Irizarry García: I was introduced to her work thanks to the specials crafted by Lacewood Productions in the early 90s when they aired here in Spain. So my question is simple: which of the—I believe six—did she find particularly enjoyable, as the author of the work on which it was based? Ah, Lacewood gave me so many treasured memories. I wonder where most of their works have gone..
Lee Williams Commented: As Co-Director of #6 with her…hope she says A Storm in April ? Lynn: I think The Last Camping Trip was my favourite because it was based on an actual camping trip we took as a family when I was a child. Lee! Great to hear from you. A Storm in April was a good one, thanks to the crew who worked on the show. You are certainly my favourite Co-Director! The Christmas Angel was also a story that appeared in the comic strip and I think it worked best as a strip. What I regret is my insistence on having a tune in every show…I think the Christmas Angel song (Elizabeth dancing with the woman in the woods) could have been better. I think Lacewood lives on under a different name. These companies tend to change hands or become absorbed into other companies. Lee…can you answer this one? Shanna Smith: How do you overcome story block? Since it’s a full story that continues over the years, versus one-offs, were story ideas written way ahead or were there moments of writer’s/artist block that you had to overcome? How did you do it? Lynn: Writer’s block affects everyone who writes for a living. If writing was easy then everyone would do it! Having faith in your own ability helps. Being well ahead of your deadlines makes the blank days work in your favour by allowing you to sit and contemplate the characters, what they are doing, how a “real” situation might pan out…A professional writer uses these times to research and reflect. Then, the ideas might come at 2:00am! Ken Gabora: After so many years, would we be able to get a “What are they doing now?” Of the Patterson family? Like a limited run? Lynn: I did a fast overview of the Pattersons’ future plans when I ended the strip. I confess, I haven’t looked at them to see what they are doing now. I think I just needed to let them go. What I enjoy most is looking at my old stuff. There were some good ideas flowing and at the time, I was so busy doing the work, running a home and playing “Lynn Johnston” that I didn’t really appreciate my own ideas! I look back now and wonder how I came up with some of them. David Pearce: Are there any characters you wish you had concentrated on more outside of the Patterson family? What would you have done with these characters if you had had the time and space? Lynn: I wish I’d had more time to develop the character “Candace”. I think she had real potential! This entry was posted in We Asked Lynn and tagged facebook interview on September 26, 2017 by fborfwnews.